What is the Higgs Particle and the Higgs Field? On the 18th February, Peter Higgs gave an in-depth interview to Jim Al-Khalili on Radio 4's "The Life Scientific" (click here). He gave a fascinating insight into his 1960s work when, considered 'a bit of a crank', he came up with the Scalar Boson, as he called it, or "the boson that bears my name". As the double-slit experiment taught us that electromagnetic waves can behave as particles, it seemed possible that particles can behave as waves. This concept is explored in Quantum Field Theory, which provides for an electron field, photon field, a field for each kind of quark, and so on. To imagine a particle field, you could picture the surface of a turbulent sea. Particles are just an excitation of their field; which is to say that atop the highest waves in the sea - the highest energy levels - a physical particle forms. So, for example, a physical electron is conjured at the peaks of energy in the electron field. Quantum Field Theory is brought together in one unifying equation, called the Standard Model, which is something like a series of recipes explaining the behaviour of the universe (except gravity). There was a Higgs-field shaped hole in the Standard Model recipe (explaining why the "Weak Nuclear Force" is nature so weak, and to explain why particles have mass). But the Higgs field is so intertwined with the Weak Nuclear Force we've never been able to evidence its existence. Enter the Higgs Particle: a side-show in terms of cosmic significance, except that its existence evidences the existence of the highly significant Higgs Field. The Higgs field is significant because it turns out to be the sea which gives property of mass to elementary particles. But there's another important part to this story. The Higgs field gives mass to elementary particles, but that doesn't mean it gives mass to you. You're made of atoms, and atoms are made up of elementary particles such as electrons, quarks and gluons. But if you add up the mass of all the mass of all the elementary particles in an atom (and by extension yourself) you'll only account for about 1% of your mass. 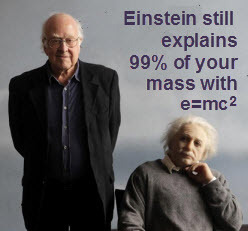 We can say that's the proportion of your mass which Mr Higgs gave you. The rest of your mass was given to you by Mr Einstein, in his equation e=mc2. Because all the energy which binds atoms together - the energy which is released when the atom is split (in a nuclear power station or a nuclear bomb) - that energy also has a mass, and that mass forms the other 99% of you. In principle, we could break apart every proton and every neutron in every atom in your body, and with perfect efficiency we'd release enough energy to supply the human race for about two years. All that energy-mass would be spent (converted), but we'd never remove the final 1% of mass which Peter Higgs gave us: the mass of elementary particles. Home > Cosmology Corner > What is the Higgs Particle and the Higgs Field?